SEPANG, 15 July 2016 – Sime Darby Auto Performance (SDAP), the official importer of Porsche vehicles in Malaysia, is hosting the Porsche World Roadshow (PWRS) 2016 at the Sepang International Circuit in Kuala Lumpur, Malaysia from 15th to 21st July 2016. More than 280 participants across Asia will be thrilled with a unique Porsche driving experience. The Porsche World Roadshow (PWRS) is a long established professional driving event held in over 45 countries around the world. Attracting more than 42,000 potential customers and car enthusiasts, the PWRS provides an ideal platform to experience the sensation of driving the complete Porsche model range. The programme is led by professional Porsche certified instructors.. Under their guidance, participants are not only able to enjoy the thrill of driving a Porsche at the Sepang International Circuit but also get the opportunity to enhance their driving skills. The PWRS programme includes braking, slalom, vehicle handling and an off-road experience, all in just one day. 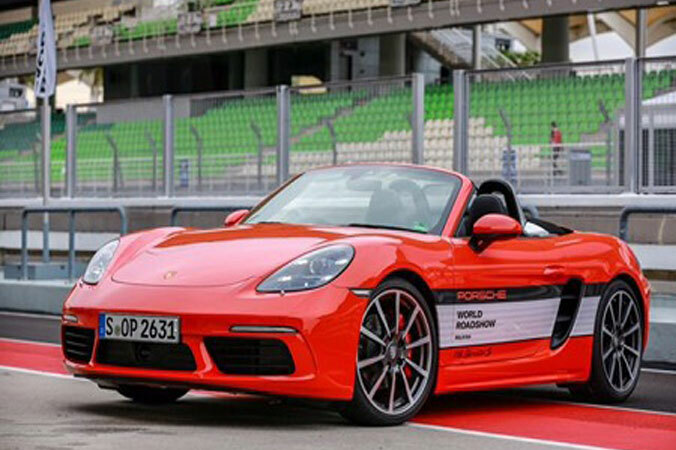 In conjunction with the PWRS held in Sepang, participants will be privileged to be among the very first to preview and experience the new mid-engine roadster – the 718 Boxster and 718 Boxster S, which are being showcased ahead of the official launch in Malaysia. The new 718 Boxster models are equipped with newly developed turbo flat-four engines with improved performance and considerably reduced fuel consumption. The PWRS offers a wide range of Porsche models for participants to experience in different sections. These include 22 of the latest Porsche cars ranging from the latest 911 models, the new mid-engine 718 Boxster models and Cayman; and the sports car for four – the Panamera as well as sports cars among the SUVs – the Macan and Cayenne models. The two-seat convertibles are now more powerful yet more fuel-efficient. With them, Porsche continues the tradition of the four-cylinder flat engines that were used in the Porsche 718 mid-engine sports cars that won numerous races back in the 1950s and 1960s. Among them being the legendary Targa Florio and Le Mans. The centrepiece of the new model series is the newly developed four-cylinder flat engine with turbocharging. The 718 Boxster develops 220 kW (300 hp) of power from two litres of engine displacement, while the 718 Boxster S attains 257 kW (350 hp) from 2.5 litres of displacement. In the S-model, Porsche also uses a turbocharger with variable turbine geometry. In fact, Porsche is now the only manufacturer to offer VTG technology in production cars with petrol-driven engines, both in the 911 Turbo and in the 718 Boxster S. Impressive here is the considerable power gain of 26 kW (35 hp) compared to the previous Boxster models and the efficiency of the new turbo engines. The new 718 Boxster models have fuel economy improvements of up to 13 per cent. The 718 model line can be made out at first glance with the front end of the new roadster exhibiting a much more sculptural form, and a wider and more masculine appearance. The much larger cooling air intakes at the front are a distinct exterior expression of the new turbo engine concept. The front end of the 718 Boxster is rounded out by the new design of the bi-xenon headlights with integrated LED day-time running lights. LED headlights with four-point daytime running lights are available as a new option. From a side view, identifying features of the new model line include new, independently styled wings and side sills whilelarger air inlet panels with two fins emphasise the car's dynamic look. The doors are now designed without door handle recess covers. Parallel full hybrid with plug-in technology, supercharged 3.0 litres V6 engine and synchronous electric motor with 416 hp (306 kW) combined system output and 590 Nm torque; 8-speed Tiptronic S; acceleration from 0 -100 km/h in 5.9 seconds; Max speed 243 km/h; CO2 emissions: 79 g/km. 3.6 litres V6 bi-turbo engine with an output of 440 hp (324 kW) and 600 Nm torque; 8-speed Tiptronic S; acceleration 0-100 km/h in 5.2 seconds; max speed 262 km/h; CO2 emissions: 234 – 228 g/km. 4.8 litres V8 bi-turbo with an output of 520 hp (382 kW) and 750 Nm torque; 8-speed Tiptronic S; acceleration from 0 -100 km/h in 4.5 seconds; Max speed 279 km/h; CO2 emissions: 267–261 g/km CO2. 4.8 litres V8 bi-turbo engine with an output of 570 hp (419 kW) and 800 Nm torque; 8-speed Tiptronic S; acceleration 0-100 km/h in 4.1 seconds; Max speed 284 km/h; CO2 emissions:267 g/km. 2.0 litres turbocharged four-cylinder engine with an output of 252 hp (185 kW) and 370 Nm torque; 7-speed double clutch gearbox (PDK); acceleration 0-100 km/h in 6.7 seconds; max speed 229 km/h; CO2 emissions: 172-167 g/km. 3.0 litres V6 turbo engine with an output of 340 hp (250kW) and 460 Nm torque; 7-speed double clutch gearbox (PDK); acceleration 0-100 km/h in 5.4 seconds; CO2 emissions: 212 - 204 g/km. Sime Darby Auto Performance Sdn. Bhd. (SDAP) is the authorised importer of Porsche in Malaysia since 2010. Sime Darby Auto Performance is under the Motors Division of the Sime Darby Group. SDAP distributes Porsche vehicles and parts and also provides After Sales services in Malaysia.